It's almost here folks! A true mark of summer, the Fourth of July. I love this holiday! The weather is always nice, everyone is in good spirits, it usually involves BBQ, you get to lay in the sun and play in the water, fireworks end the day, and of course there's amazing food. Forth of July fare is comfort food at its finest. One thing I particularly enjoy about cooking for this holiday is the abundance of fresh fruit. The pies are one of the best parts for sure. But If you're looking for something maybe a little cooler and more refreshing this trifle fits the bill. Nothing but fresh fruit and homemade whip cream, you can't beat it. What better way to celebrate our independence from the English than by eating a dessert they created but putting an American twist on it! In trifle dish put a layer about an inch thick of whipping cream. Then using about 3 cups of the blueberries spread evenly over the whip cream. Next add another layer of whip cream, this time about 2 inches thick. Next add a layer of about 3 cups of the strawberries. On top of the strawberries add another 2 inch layer of whip cream. Now you can decorate the top how you like. 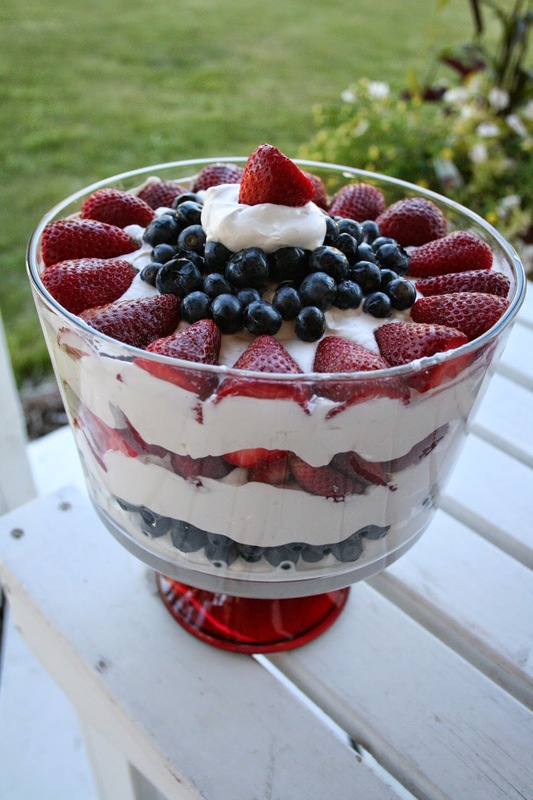 I put a ring of strawberries on the outside, with a circle of blueberries in the middle. 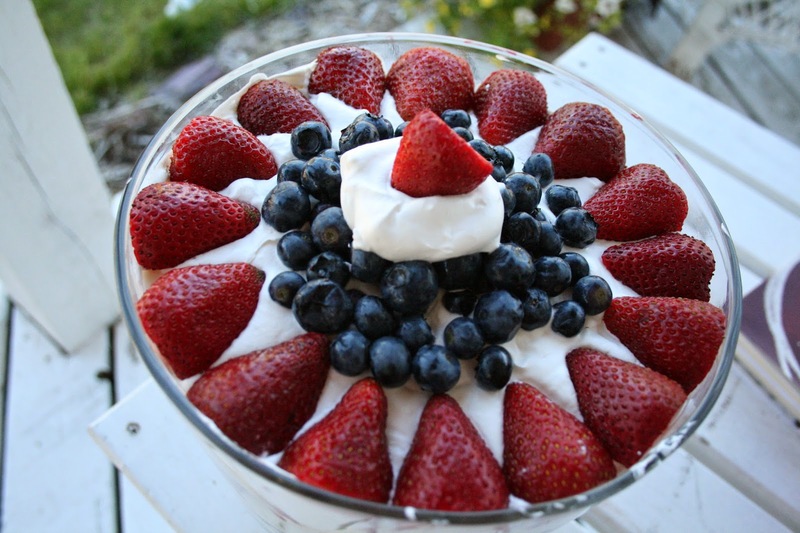 Then I put a dollop of whip cream in the middle of the blueberries and added a final strawberry on top. Keep refrigerated until ready to serve. Serve on top of vanilla bunt cake or all on its own, both ways are delicious. Enjoy! Serves about 10.